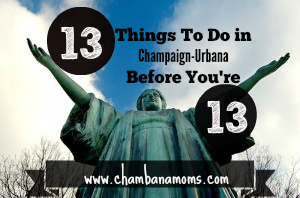 It’s no secret that Champaign-Urbana and beyond has a ton to do for your kiddos. But what are the definitive things your child should do before they are officially a teen? We’ve brainstormed, asked our readers for their input, and finally narrowed down these 13 things as the “must do” events in CU with your kids before they are 13. How many things can your kids check off our list? Are we missing something in our Top 13? Let us know in the comments!